(NB: If you're reading this on Facebook, the original post is from my blog). Ulster-Scots food? The usual knee-jerk response to this is some sneering comment about battered Mars Bars, the obvious haggis - or perhaps the glorious egg & onion sandwich! As ever with Ulster-Scots subject matter, in between the scorn - and the trivialisation - there's a deep and important story to be told. Mary Drymon is an American writer, historian, museum educator and curator who has recently published an important book called “Scotch-Irish Foodways in America”. (I am glad she stuck with the historic term "Scotch-Irish" and didn't adopt the recent "Scots-Irish") She has based the book on the recipes known to have been used by Ulster-Scots emigrants who arrived in Maine in the early 1700s. Mary's research indicates that it was Ulster emigrants who brought rhubarb to America - as was the case with potatoes. (NB: If you're reading this on Facebook, the original post is from my blog). John Gray sang this at Carrowdore Mission Hall last Sunday night - a lovely rendition of an old hymn from the late 1800s. I found this version by Natalie Merchant (who sang with Wilco and Billy Bragg on the great "Mermaid Avenue" album of old Woody Guthrie songs). Glasgow man William McEwan, "the world's first great gospel singer", recorded a version in New York in May 1926; the brilliant Virginian singing Baptist pastor Alfred Karnes recorded it in 1927 (download his version free here) and the McCravy Brothers recorded it in 1930. (NB: If you're reading this on Facebook, the original post is from my blog). A few days ago I was astounded to receive the following note on Facebook. The irony is that for a good few months now I've been thinking about deleting my Facebook page because people keep inviting me to play games or join causes that I don't really have the time or interest to get involved in, and so rather than risk offence I figured that shutting it down would be a good move. I ran across your personal blog yesterday while searching for more information about the Ulster Scots language, and found a treasure trove. I ended up looking at your other sites and got such a blessing! My Granny was born and reared on a farm outside Bushmills, County Antrim, and was converted at the age of fifteen in an evangelistic meeting. Her parents were saved through an evangelist at an earlier period. My grandfather, John Stewart, was born in Lurgan and was an orphan by the age of seven. My grandparents emigrated separately to Scotland. My grandfather was saved there and met my Granny. They married in 1904. My dad, James Alexander Stewart, was born in Glasgow and was "fitball daft". The Lord saved him when he was a teen and he became a boy preacher. He preached all over the British Isles as a boy. He met my American mom in Budapest, Hungary where she was ministering under the Southern Baptist. My parents travelled so I did not get to spend a lot of time with them. Dad also founded mission organizations and wrote many books. I say all that to explain that I when I was with them, Dad read me stories about the Covenanters, and told me all about Revival. (He saw Revival under his ministry as a young preacher in Europe.) He taught me Scottish history and all about the great Scottish preachers etc etc. I also got to spend time with my parents during their meetings. Dad especially loved open air meetings. I saw that you had "Fu an skailin" listed on your Sacred Scots Songs page. My husband and I still teach it to children along with "Come Awa the Noo". My family knew Seth and Bessie Sykes, as well as "Uncle Charlie' Main. Uncle Charlie was a mentor to Dad and I remember him even participating with Dad in the open air on the beach at Bangor as part of the Bangor Missionary Convention in 1965. Willie Mullan, Ian Paisley, WP Nicholson, Stanley Mawhinney, Herbert Mateer, and many more were part of the dear ones in Ireland. Well, "I'll Fly Away" now! A lot of stuff has been written over the past 15 years or so about Ulster and America, much of it about centuries-old Presidents (whose Ulster links, in some cases, are pretty thin), much of it repetitive and very far removed from the common cultures of ordinary people. Sharon's email shows that there is still, alive and well today, a common evangelical faith and culture which spans Scotland, Ulster and America, and that some of the wee songs that I grew up with here in the Ards Peninsula, which had been taught to my parents and grandparents by the "oul Scotch preachers" like Seth Sykes, Charlie Main and Jock Troup, are still being sung today in the mountains of North Carolina. (NB: If you're reading this on Facebook, the original post is from my blog). 1637 Book of Common Prayer, Scottish edition. As (not) recommended by Jenny Geddes. On eBay now for $900! (NB: If you're reading this on Facebook, the original post is from my blog). On Monday evening past, I was a stand-in speaker for Immanuel Presbyterian Church PWA (now called Presbyterian Women) on Agnes Street in the Shankill area of Belfast. The speaker who was booked had to go gallavanting off to America last week, so the ladies at Immanuel put up with me instead! I took a powerpoint along with lots of images but very little text, just as visual aids for the talk. I started (as you might expect) by pointing out a few of the myths and nonsense, then the Scottish stories and legends of Patrick, the Patrick-related placenames in Scotland, the early Ulster-Scots records of Templepatrick near Donaghadee, then onto the similarity of portions of his Confessio and Psalm 40, the Cross of St Patrick flag and its modern applications in logos (like the PSNI badge), Patrick Hamilton the first martyr of the Scottish Reformation and the origins of Scottish Presbyterianism, and finished with the work of Ulster-born hymn tune writer William James Kirkpatrick - "My faith has found a resting place not in device or creed...". A light and enjoyable evening for me, and apparently for the audience too! (NB: If you're reading this on Facebook, the original post is from my blog). "...For there is no other God, nor ever was before, nor shall be hereafter, but God the Father, unbegotten and without beginning, in whom all things began, whose are all things, as we have been taught; and his son Jesus Christ, who manifestly always existed with the Father, before the beginning of time in the spirit with the Father, indescribably begotten before all things, and all things visible and invisible were made by him. He was made man, conquered death and was received into Heaven, to the Father who gave him all power over every name in Heaven and on Earth and in Hell, so that every tongue should confess that Jesus Christ is Lord and God, in whom we believe..."
(NB: If you're reading this on Facebook, the original post is from my blog). My parents came off with this on Sunday, and I don't remember ever hearing it before. Hilary just hopes they weren't talking about the Sunday lunch she'd made that we were all eating at the time! (NB: If you're reading this on Facebook, the original post is from my blog). I took this pic on my Blackberry a few weeks ago. Looks like the sea levels have risen and the Ards Peninsula has sunk into the sea... Lough Swilly and Inishowen look like they're in trouble too! (NB: If you're reading this on Facebook, the original post is from my blog). Set aside all of your (perhaps valid) perceptions of US evangelists - the ones on tv with the scrolling information along the bottom with their credit card hotline numbers, who beg for donations and infer that they can arrange for a Divine blessing for every £ or $ you send them. Mark Driscoll, of Mars Hill Church, is based in Seattle and has been described as "the fierce new face of American evangelism". He has become well-known around the world (thanks to the internet age, where he generates the occasional bit of controversy) for a frank and pull-no-punches preaching style, and is making his first visit to Northern Ireland for this year's annual Mandate event in Belfast on 13 November. Having been raised in wee rural halls, I tend to avoid big things like Mandate, but I hope to go this year to hear him preach. His books, Vintage Jesus, Vintage Church and Doctrine - What Christians Should Believe - give a solid foundation about the Person we should follow, what Christians should believe, and how the local church should operate. In particular, Mark Driscoll draws the listener's attention to Jesus. That might sound like a strange thing to say, but if you tune in to what's being said and sung in many churches today, you might conclude that the faith being presented should be called God-ianity. They might be unconsciously drifting that direction - but they should be into Christ-ianity. On the radio just this morning I heard a local minister downplaying the uniqueness of Christ. In his many online sermons I've heard and watched, Mark Driscoll's aim is (as Hebrews 12 says) to "fix our eyes on Jesus, the author and perfecter of our faith". There's a huge back catalogue of Driscoll sermons on the MarsHillChurch.org website, and I often listen to them when I'm working at my desk - far better than Stephen Nolan! I get through maybe 4 or 5 of them every week. Some traditional Ulster folk (a solid, reliable and cautious breed which I count myself among) will find Driscoll's style a bit uncomfortable at first, but the substance of what he says, and all without notes, more than compensates. Here are two recent sermon clips from a series he preached entitled "Luke's Gospel - Investigating the Man who is God"
There are hundreds more clips and sermons on the MarsHillChurch YouTube channel - take some time and enjoy them. (NB: If you're reading this on Facebook, the original post is from my blog) This is a song that was played constantly in our house, on a tape by the old Belfast group the Echoes of Grace which they brought out ("released" is far too contrived a term for how it was done back then!) in the early 1980s. The Wee Echoes had mandolin, guitar, and lots of singers - usually 7 or 8 in the group at any time. My da still watches video tapes of their concerts, and herds visitors into the front room to watch them too! I hope that the forthcoming Ulster-Scots broadcast fund will enable projects like this to be produced, which delve into deep, rooted stories of real people and their culture. Over the next few weeks the annual St Patrick stuff will be ratcheted up. I'll freely admit to having mixed views about Patrick - there's certainly a story in there somewhere, but it's buried under centuries of mythology, mumbo-jumbo and a heavy dollop of nonsense added for good measure. Efforts have begun already to prevent a repeat of last year's drunken riot in a specific part of Belfast. Sir Hugh M: "Weel Patrick, you're looking for some of my new Ulster estate eh? Well, my new friend Con O'Neill, whose family have been here for sixteen generations, says that your namesake, Patrick the evangelist, arrived just a mile or two from here in a wee spot that the locals call Templepatrick near Creboy (Craigboy). Would that do ye?". Patrick M: "Aye, that's a nice wee spot. And on a clear day I'll be able to look across to Portpatrick in Scotland, which is named after him forbye - it's the port that all of our new tenants are sailing from. Y'know, Hugh, if you made enough money here in Ulster maybe you could even buy Portpatrick from the Adairs!" Sir Hugh M: "Patrick, ye're no as daft as ye look..."
And so on. 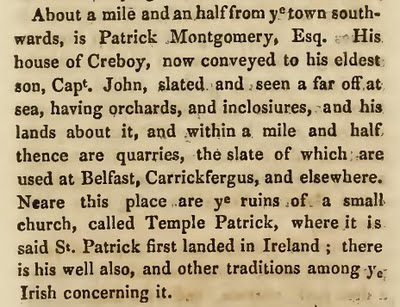 Joking aside, it is of significance that William Montgomery recorded the Templepatrick story in 1683, and said that there were "other traditions among ye Irish concerning it". William Montgomery was a close friend of the local Savage family, who by then had been living in the Ards for about 400 years and who provided much of the content for his writings. It would be ironic if, with all of the money and attention lavished on Downpatrick, Armagh and Slemish, if a forgotten and overgrown wee burying ground just south of Donaghadee was actually the place where he arrived.